My name is Cathi, and I’m an overwaterer. Yes, it’s true. Last year, in my first summer of gardening (which was, in my defense, was also the hottest summer on record) I was so eager to love on my garden each and every day that I never missed a day of watering. Starting early in the Spring and lasting well into the Fall I watered every day unless it rained. So of course, not surprisingly, my town community garden bed is suffering with fungus. See the fungus-y fungus all through my wonderful tomato plants? Therefore, based on the research I have done on the subject, I have reformed my ways. 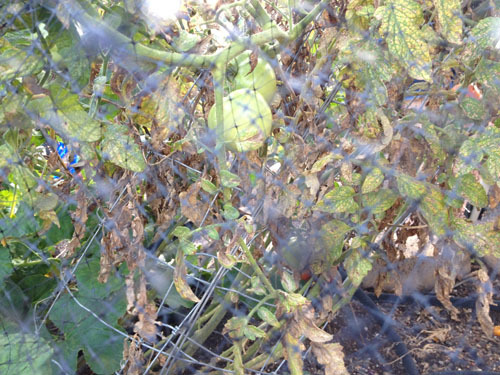 How can you avoid overwatering your vegetable garden? If your plant is wilting and brown, that means underwatering. If your plant is wilted and yellow, that means you are an overwaterer. Most vegetable gardens need one inch of water per week. Stick a rain gauge in your garden so you can tell how much rain you’ve had. I recently bought one for $2.99. Stick your finger in the dirt. Does it feel cold? Then it’s wet. Feel the soil 3 or 4 inches deep to see if you need to water. There are many other ways to love on your garden that don’t involve overwatering. You can pull weeds. make free organic fertilizer, make a worm box, browse through seed catalogs, thin your plants, or just sit and enjoy your garden.